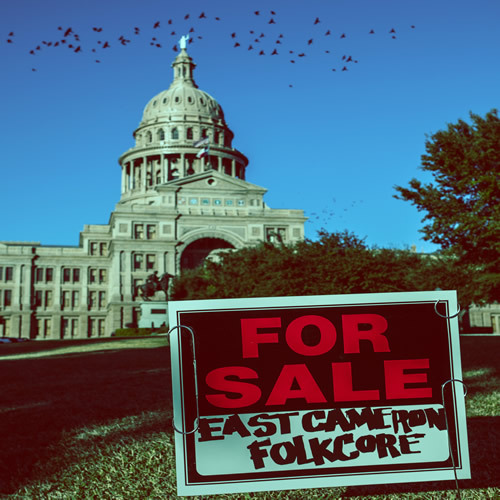 As if ripping a page from the Chumbawamba anarchy-as-art field guide, East Cameron Folkcore’s For Sale careens like a pinball from Irish-drinking-song joviality to mad-as-hell, Occupy activist exhortations. Yet throughout this nearly 47-minute exercise in creative noise-making, the 11-member Austin collective makes one message abundantly clear: Anger can be fun. In “Worst Enemy,” heavy rock riffs meet plucks of delicate mandolin; in contrast, “Don’t Choke” ladles heavy baritone sax over Moore’s scraped-raw vocals and a melody straight out of Grease — complete with girl-group choruses and a doo-wop finish. Hey, if the past is better than the future, why not revisit it? Nothing wrong with a little joyride en route to the apocalypse.